When one hears the name “Lee”, typically Robert E. Lee comes to mind. However, it is named after Robert E. Lee’s father, “Light Horse Harry” Lee. Lee graduated from the College of New Jersey (now Princeton University) in 1773, and began pursuing a legal career. 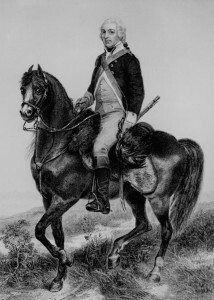 With the outbreak of the Revolutionary War, he became a captain in a Virginia dragoon detachment, which was attached to the 1st Continental Light Dragoons. In 1778, Lee was promoted to major and given the command of a mixed corps of cavalry and infantry known as Lee’s Legion, with which he won a great reputation as a leader of light troops. It was during his time as commander of the Legion that Lee earned the sobriquet of “Light-Horse Harry” for his horsemanship. On September 22, 1779 the Continental Congress voted to present Lee with a gold medal—a reward given to no other officer below a general’s rank—for the Legion’s actions during the Battle of Paulus Hook in New Jersey, on August 19 of that year. Lee was promoted to Lieutenant Colonel and was assigned with his Legion to the southern theater of war. Lee’s Legion raided the British outpost of Georgetown, South Carolina with General Francis Marion in January 1781 and helped screen the American army in their Race to the Dan River the following month. Lee united with General Francis Marion the Swamp Fox and General Andrew Pickens in the spring of 1781 to capture numerous British outposts in South Carolina and Georgia including Fort Watson, Fort Motte, Fort Granby, Fort Galphin, Fort Grierson, and Fort Cornwallis, Augusta, Georgia. They conducted a campaign of terror and intimidation against Loyalists in the region, highlighted in Pyle’s Massacre. Lee and his legion also served at the Battle of Guilford Court House, the Siege of Ninety-Six, and the Battle of Eutaw Springs. He was present at Cornwallis‘s surrender at Yorktown, but left the Army shortly after claiming fatigue and disappointment with his treatment from fellow officers. During the infamous Whiskey Rebellion, Lee commanded the 13,000 militiamen sent to quash the rebels. Henry was the Governor of Virginia in 1793 when Lee County was formed from Russell County. It was named in his honor.